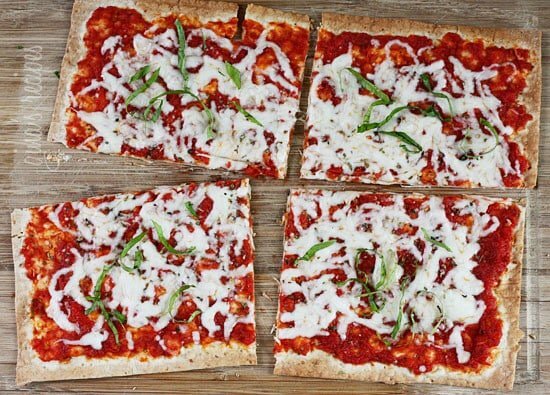 If you like thin crust pizza, you’ll love these super easy Lavash flatbread pizzas! Kids love them and they take only minutes to prepare. Lavash is a Middle Eastern flatbread, usually found in the deli section of your supermarket, or you can find it at Trader Joe’s. 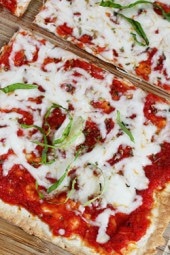 Last week I posted my quick marinara sauce recipe, which is the perfect sauce for these thin crust pizzas. 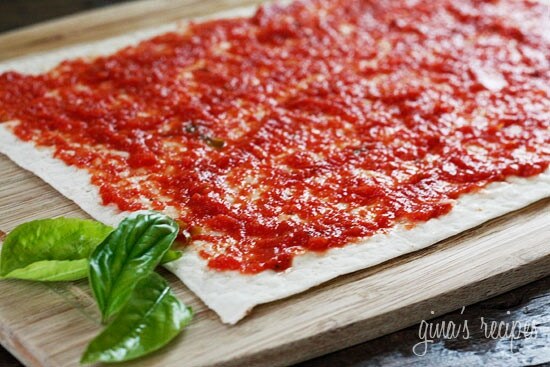 You can either cut the Lavash into 4 squares before you add the sauce which will give you crispy edges all around, or you can make one large pizza and cut it after. This is a perfect recipe to make with your kids, they will love making their very own pizza, and they can add whatever toppings they like! It can even be a kid-friendly Passover dish. Top with cheese and oregano, then bake until the cheese melts, about 5 minutes. Top with fresh basil and eat immediately. Love this/ Joseph Lavish bread is only 60 calorie per half, and works out great. 5 minutes is almost too long, be sure to watch. I used my pizza stone. I used fat free feta on my half. It is good recipe to just use 3 tabs of sauce, really have to work to get it spread around but I can see it was just right amount. Can’t wait to make again. Lunch for the next few days. This is so easy to make. Everyone in the family loved it! I had to make more to satisfy the demands of my children. This is a great meal for busy weeknights. Pair it with a side salad and you’ve got a tasty, healthy, quick and easy meal. You can’t ask for much more. Coming late to the discussion — just found this page. We're low-carbers, and I've been using Joseph's lavash to make quesadillas. I was just thinking that I could probably make pizza with them, so googled and found this. Thanks — sounds perfect! And for anyone still looking for the Joseph's lavash, I wanted to note that you can buy them online at netrition.com. Pretty sure this recipe just saved my life. I used a modified sauce that I love (saute a chicken sausage link, onion, garlic, kale and whatever other veggies you have left over. Add chopped artichoke hearts, roasted red peppers and some diced tomatoes) and sprinkled with cheese. It was perfect! Do you know a good healthy recipe for the lavash bread? I live in a place where it's either very hard to find it or very expensive. YUM! Made this tonight on the Joseph'e lavash and it was so good! I'm thinking of trying pesto next time :)Thanks Gina! Lavash, Pita or Tortilla's work just as well. Where do they carry this flat bread? Not only was this delish, it was super easy too! So easy that I let my 3 year old prepare it for me while I sat back and watched! I can't wait to try this recipe! I found Lavash at BJ's (it's like a Costco or Sam's) and I stocked up! I think even my Meatatarian husband would have something like this! With 2 growing and picky boys, this would be just the trick to prevent buying fattening pizza from the store or pizza parlor. Sometimes all it takes to keep them from being picky is letting them put the toppings on! I love this recipe. I add spinach, jalapenos, banana pepers. My 3 year also loves this recipe. 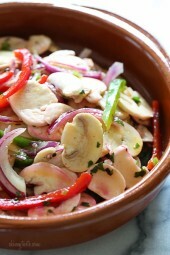 This is such a yummy treat, it's a great quick lunch for everyone in the house! One suggestion… I like to put the lavash under the broiler for a minute or two then flip it over and add the toppings. It makes for a really crispy crust! why do you have to eat it immediately ???? because im cooking this for my DT class and i wont be able to eat it straight away will it be edable to have it later ???? The possibilities are endless but I wanted to start with a basic recipe, I'll be posting variations soon! Oooh, now this is such a sneaky little recipe! My anti-health food DH could NOT sniff this out for the life of him. He gobbled it up for dinner AND for lunch the next day! I once heard that the best recipe is one that is flexible, and this is it. For my DH, topped his pizza with hot Italian sausage and pepperoni. For me, I sprinkled my pizza with pineapple and mushrooms. DELISH!!! This most definitely will go in the rotation. Thanks Gina! Gina, my family loves pizza and while I am a pretty good cook, I have never been able to master pizza at home. I have made crust, bought crust, and never had any luck, for years. You have finally solved my dilemma! I made this tonight and my kids and I loved it. Many thanks! I love all of your recipes, but this one is especially great. This is becoming our favorite quick lunch. I looked at our local TJ's for the lavosh, but they didn't have any. Hubby used Flatout Lite instead (2 of those for 1 recipe), and it works great! This if very good and fast. I added a little Turkey pepperoni, mmmmm good! Excited to try this! I was hoping for some pizza recipes. TY! After investing in a BAKING STONE and Joseph's Low Carb Lavash I made this last night for my picky eater husband….He LOVED it…He loves thin crust pizza and he said "this was the best pizza he's ever eaten…"This will be a regular in our house. THANK YOU SO MUCH!!! Just fixed this for my supper tonight, used your Pasta Sauce on it with the sweet italian turkey sausage in it. OMG…it was so wonderful…and I also used the Joseph`s Lavish which is very wonderful. Fat free mozzarella cheese and it was absolutely completely satisfying. Thanks!!! My hubby and I have been making these for a while and we prefer ours super crunchy so I pre cook the flat breads for 8 mins before layering the toppings. Marinara, mozerella, fresh basil & turkey sausage is our favorite combo. I often make my flat bread from scratch but I do like the ones from Trader Joes. Erguvan Said "Hi, I like thin crust pizza, it was also very ambitious, liked it very much, loves." I bought Jospeh's Lavash today at Walmart….My pizza stone comes tomorrow from Amazon…Can't wait to make this delicious treat~! Diane- Walmart, Trader Joes, they even have it in my local supermarket in the dli section. As someone mentioned, Flat out's would work if you can't find them, although I have not tried it. What I love about Lavash is the crisp texture it gets after baking. Delish! Infinion – Enchiladas were actually my initial plan. I saw you can buy the Joseph;s brand online, in bulk I think. Thanks for sharing! Great to see a lavash bread recipe here. I think I suggested you use it for pizza some time ago. Walmart usually carries the wonderful Joseph's brand of lavash bread, but alas, out walmart has stocked stocking it, and we can't find it in town anymore. Sad. We'd been buying every pack would could find at walmart, but they still stopped selling it. They seem to take away anything that is remotely healthy in favor of heavily processed junk around here. Sadly, we have no other source except the internet. When we used to make Lavash bread pizza, I used one of those raised cooling racks on top of a baking sheet to prebake the bread, making it nice and crispy all the way through. Then build the pizza, and bake until the cheese is melted. We've also found lavash to be great for enchilada dishes. We also use them for tacos and similar meals. Wow! Thanks for this recipe! I bought some lavash a while ago, and had it in my freezer without a clue of what to do with it! I will definitely be making this when I come home from work! I love Joseph's flatbread (and their pita bread), too. I am anxious to try the pizza. I have some pizza flavored hummus and was wondering if that might work. where does one buy the LAVASH FLAT BREAD? I found it at Wal-Mart and love it! I found it at Stop & Shop in the deli section with the pita bread and such. Trader's jone, Walmart, Sam's, King store, Joes, some Albertson and Ralph carry it too. I have also made pizzas with flat-out lite. I have even put it on the grill and it's great!! If we add chicken sausage and cheese you can eat a whole flatout pizza for about opts! It even fills up my husband. I just pinned this one. I have to make this. 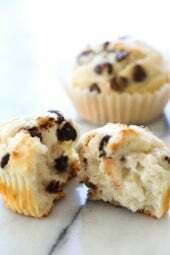 I am having so much fun looing at all of your recipes! So thin, and I bet very delicious! 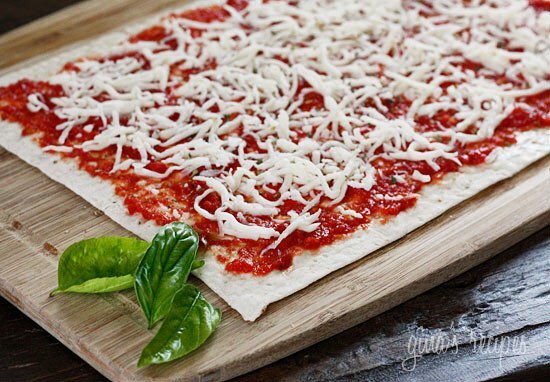 We use rice wraps for our homemade pizzas (gluten-free). They turn out nice and crisp! But I do love the look of a rectangle slice! I'll have to look out for Joseph's Low Carb Lavash Bread, thanks for sharing that info!! Yes Gina I love thin crust pizza; must look for lavash flatbread, but we don't have Trader Joe here. Who knew you could find it at Trader Joe's? I didn't! Thanks! We have pizza one night a week and I am always looking for ways to change things up! Merhaba,ince hamur pizza severim,bu da çok iddialı olmuş,çok beğendim,sevgiler. 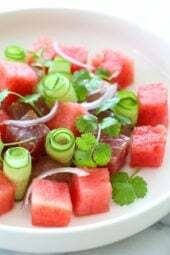 Love this idea – super creative and lightens up one of my favorite dishes! I LOVE making my pizzas like this. It is a family favorite of ours! My version is only 2pts+ though!! To lower the point value I use Joseph's Low Carb Lavash Bread (Gina, are you close to a Wal-Mart? It is the only place I can find it. It's in the deli/bakery section. It's a whole grain lavash bread with flax seed and other healthy stuff too). Half of a rectangle sheet,which is a big portion,is only 1pts+!! (it's yummy for wraps and other things too) I'm kind of stingy with my points and I find you can't use enough of the mozzarella cheese to get a taste so instead I use 2 TB of low fat ricotta to which I add some italian spices. (It gives a cheesy-like gooeyness to the pizza instead of the mozzarella) I spread that on the bottom of the lavash bread, then top with tomato sauce along with whichever veggies I have on hand(mushrooms, onions, peppers, zucchini, etc). Sprinkle with a little garlic powder. I place it on one of the aluminum pizza pan with the holes all over the bottom so the crust gets crispy (if anyone is having trouble getting the lavash bread crispy you can also try lightly toasting it in the oven for a few minutes before putting all the toppings on). 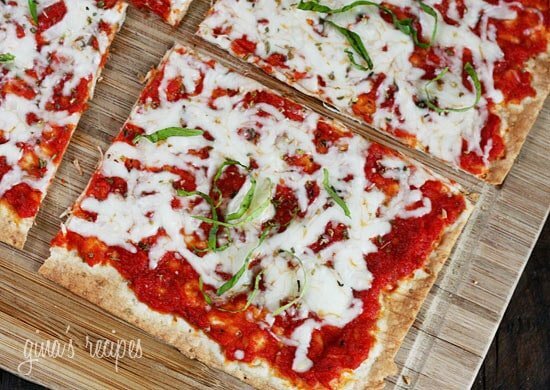 I'll take a lavash pizza over a regular slice of pizza any day…lol! Soooo good!! I found Joseph's Low Carb Lavash at our local BJ's. I live on the east coast, and BJ's is just like a Costco or Sam's. I found it in the bakery section, and I bought a whole bunch and froze them to use later. This same recipe will work with leftover pita. We make Pita Pizzas all the time, but the lavash looks amazing. You are all welcome. I still plan on posting a real pizza soon, but it will take more time. This is perfect for a quick lunch or snack. This is best made on a pizza stone, if you don't own one a baking sheet would work. Hmm. A lavash full slice has 8 net carb grams. Half (which is your ‘serving) has 4 grams. Does your marinara really have that many carbs that pushes a serving up to 24 grams? ahhh i posted on your facebook about pizza last week or so, THANK YOU FOR POSTING THIS!!!!!!!! football season will be wonderful with pizza now!! Hi Gina – Wow! Your website is the absolute best. I just found it this past weekend while looking for WW type recipes. Since Sunday I've made your chicken nuggets, black bean brownies, spinach dip (2x), Avena for this mornings breakfast – wow, that was excellent!, and tonight I'm making your lasagna roll ups. You do such an excellent job – thanks so much for making cooking a new joy instead of a boring job!!! Wow this looks so good! I've been meaning to find a good low-fat pizza recipe so thanks for that 🙂 May I ask, what's a good alternative to lavash flatbread? Because I don't think I will find it where I live! Yum! Is the lavash sturdy enough to cook it directly on the rack in the oven or do you need to cook it on a tray? With Lavash, you dont need pizza stone. They have thicker Lavish Bread that is a stop and shop brand its 100 Calories per piece but still has the size and health benefits. I wish this was my lunch!